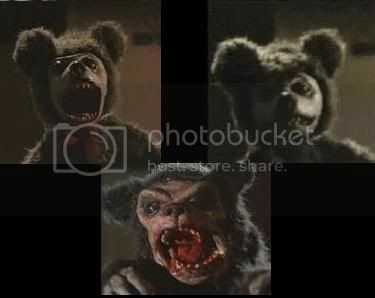 Original film used Devil Demon Baby Puppet From "Demonic Toys". Came with Loa signed by John Carl Buechler. This would be My favorite Prop Out of My collection . 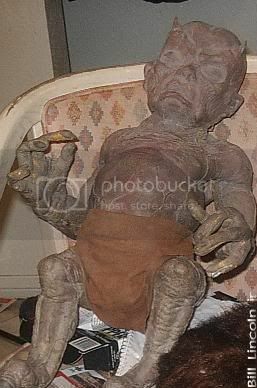 Screen shot from Movie of the Demon baby prop. 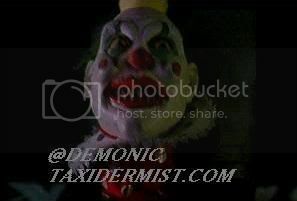 A friend of Mine Dennis His "web site"
has Agreed to let me show These Magnificent Demonic toy Props on my Site. These Are all of The original Film used Demonic toy Puppet's from the Demonic toys "1992" film.some of which are on hold for me to own in January sometime. The Teddy bear, Baby Oopsy Daisy, and The Toy robot should be coming to my collection until then I thank you Dennis for Letting me use the pictures from you're site. Teddy Bear "Grizzly" This is the hero, working teddy bear used in the close up scenes where the teddy growled and snarled for the camera. 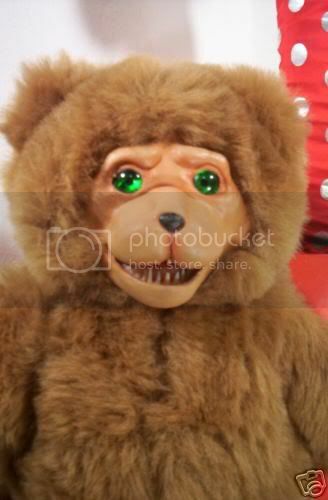 When operated, the cables cause the teddy bear's facial expressions to change and it is still fully functional. It comes with a Letter of Authenticity from John Carl Buechler, the toy designer. Baby Oopsy Daisy This was the stunt, though extremely detailed Baby Oopsie used in the scenes where the cast would hit and throw things without fear of damaging the working puppet. It comes with a Letter of Authenticity from John Carl Buechler, the toy designer. Original Demonic toys Jack in the box "Stunt Puppet". 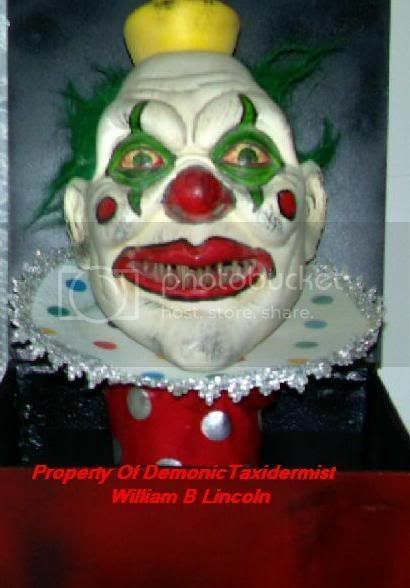 This Prop was Auctioned off and obtained from the Charles band Roadshow sep, 23, 2006.
original screen used Extremely detailed clown jack in the box puppet used in close up scenes. It comes with a Letter of Authenticity from John Carl Buechler, the toy designer. Toy Robot Hero, working robot. The arms move up and down and body rotates through two cable linkages. One of the eyes lights up and the other needs to be replaced. The battery compartment needs cleaning to test if the robot rolls forward and backward. Purchased from Profiles In History auction 18 when Full Moon video sold off all of their puppets and artwork.